Campton is best known to most New Hampshire visitors as the I-93 exit for Waterville Valley. But this town on the Pemigewasset River is worth more than a quick pass-through on your way into the piece of White Mountain National Forest that fills its northeast corner. Like so many other towns in the central part of the state, it was settled in the 1760s, chartered by the Royal Governor to a group of men that included Colonel Joseph Spencer of Connecticut. The first town meeting was held in Spencer’s house, where he was elected town clerk. Spencer’s name is remembered today for the B&B, the Colonel Spencer Inn on Route 3, which occupies a property he owned. None of the original settlers were named Campton, and one account relates that the name was given to the town because this was where the original surveyors camped while they marked the lines. Just as likely, it was named — as these grants often were — for a friend of Governor Benning Wentworth, Spencer Compton, the Earl of Wilmington. The Campton Historical Society is headquartered in the Town House, an 1855 building on Route 175 in Campton Hollow that houses its collections. It’s open by appointment only, but their website includes a lot of information, including a guide to the series of historical markers they have put up throughout the town. These mark buildings and sites of note in Campton history, including churches, settlement sites and a number of schoolhouses. It was from the historical society that we learned that Campton was the birthplace of Sylvester Marsh, the engineer who designed and built the Cog Railway to the summit of Mount Washington. He was born September 30, 1803, at his family’s farm near Campton Hollow, where he lived until he moved to Boston at age 20. After the Campton Congregational Church was moved to its present location near the Town House in 1858, Sylvester Marsh donated the church bell for its steeple. Another historic marker tells about Blair Chapel on Red Sleigh Road, off Route 3, just south of the intersection with Blair Road. Blair Chapel was built around 1883, complete with horse sheds as a convenience to guests at the nearby Blair’s House hotel. Nondenominational services were conducted here until 1911 by visiting ministers and theology students from the New Hampton Literary Institute (forerunner to the New Hampton School). The chapel was later converted into a guesthouse, which operated into the 1980s, and is now a private home, but the adjacent land was preserved as Blair Woodland Natural Area. Trail maps are at the entrance, and signs identify native trees and plants. Historic markers note several former schoolhouses and Campton’s three covered bridges. The newest of these is Bump Bridge, built in 1972 to replace the 1877 bridge when it was no longer repairable. Turkey Jim’s Bridge, at Branch Brook Campground off Route 49, replaced the original 1874 covered bridge here in 1958. The current bridge was dislodged and washed downstream in 1964, but was rescued and returned. Blair Bridge dates from 1869, replacing an 1829 bridge that was burned by an arsonist who claimed God told him to do it. This two-span bridge over the Pemigewasset is one of New England’s longest, at 292 feet 10 inches. You’ll see cars lining the roadsides here on a summer day; the sandy riverbank is a favorite local swimming place. Another reason to stop here is for lunch or dinner at Covered Bridge Farm Table, a restaurant where Asian, French, Italian and Spanish cuisines fuse with traditional favorites. The porch overlooking the river and covered bridge is glassed in for year-round views, and there is also an outdoor patio in the summer. Begin with seared day-boat scallops with raspberry compote and wasabi cream, before an entrée of duck confit with lingonberry-cassis sauce and puréed sweet potatoes. For a quick lunch, stop at The Little Red Schoolhouse for fried clams, scallops, fish and chips, a lobster roll or the Angus beef burgers. You can shop for local crafts in this 1878 schoolhouse too. For really good coffee, look for Mad River Coffee Roasters on Route 49 just off the highway. They craft-roast quality beans from around the world, and it’s been voted as a reader favorite in the White Mountains Region in New Hampshire Magazine’s Best of New Hampshire. 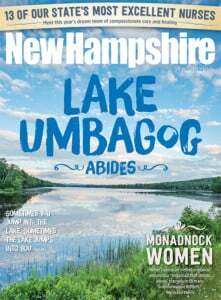 This is also where you’ll find Ski Fanatics, the place to rent a kayak or canoe for a paddle on the gently moving waters of the Pemigewasset. Ski Fanatics not only rents you the craft, they also deliver it to the river and pick you up at the end of your trip. Choose a 3- to 4-hour trip or a longer 10-mile stretch of river. Either way, you’ll find beautiful scenery, swimming beaches and places to fish. In the winter, as the name implies, Ski Fanatics is the place to rent skis or boards. If riding a horse along the river bank sounds better than paddling the Pemi, Rocky River Ranch offers guided trail rides and western horseback riding lessons for all experience levels. Guided trips for advanced riders go through the river instead of along it. When snow covers the valley, stop here for a sleigh ride. Whether it’s a riverside riding trail, a place to tube or kayak, a sandy riverbank beach for swimming on a summer day or the setting for a covered bridge, the Pemi River is an integral part of Campton. After miles of gentle meandering through town, it leaves with a final flourish. Just before it flows into neighboring Plymouth, the Pemi suddenly narrows, dropping over a rocky falls and rushing between steeply sloping ledges at Livermore Falls. Follow the trail down from Route 3 to see the falls and the brick and granite-block remains of the water-powered mill that once harnessed its force.